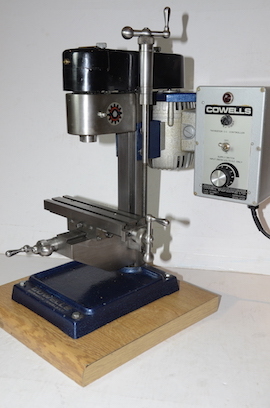 Cowells Milling Machine. Just arrived, Very hard to find on the pre-owned market. This one in good condition with variable speed motor and rear controller unit. Does have three overmilling holes in bed. Be quick as these Cowells mills sell very quickly. Photos just added below. Don't often come up for sale. A Portmac Redman Mini Miller, type A. Small horizonal mill from Bristol, England. A rare item, super modelmaker's unit. machine. Single phase, Desired R8 spindle. Can't see any sign of use !!!!!! Lovely Sigma Jones Jig Borer. BCA. 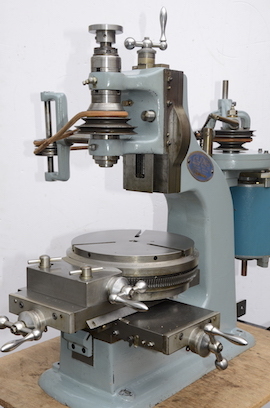 Rotary table, single phase motor. Quality mill, a real Myford users favorite. Stunning & hard to find item. mount behind your Super 7 or ML7, etc. for a Myford lathe or milling machine. 77cm wide, 51cm deep & 83cm tall. Wheels on rear & handle at front. BCA MK3 jig borer rotary table. Later 4 slot table in good condition. Ideal if your table is damaged. Stunning Emco FB2 Milling Machine. Genuine Emco table power feed. 630 x 150mm table. Single phase. spindle. Horizontal & Vertical capability. Selling on behalf of a Friend.